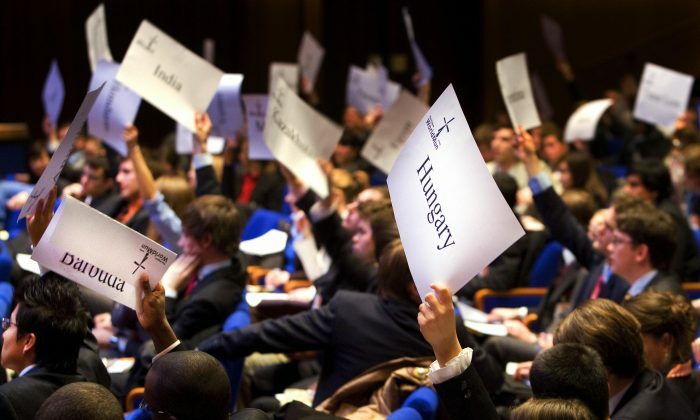 When the Harvard Model United Nations (HMUN) prepared for its annual meeting, the organizers didn’t expect any trouble. Well, they should have expected some trouble because the dialogs and debates imitate the real U.N., which has many conflicts. Trouble came, though, when an instructor of the Chinese delegation saw that the program listed Taiwan as a country. He protested. The protest was not necessary, but it is understandable—he is supposed to represent China’s policy. Actually, those are different issues. For the first part, since the United Nations transferred the seat from the Republic of China (ROC, which includes Taiwan) to the PRC, no one in the world has ever challenged this one-China policy, not the U.N., not the United States, not the countries that have diplomatic relations with the PRC, not even the countries that still keep diplomatic relations with the ROC. I don’t think a model student U.N. program could change that. Whatever that program does, China is a country with thousands of years of history. What the regime really cares about is who can legally represent China. ROC was the first republic in Asia, established right after the overthrow of the Qing Dynasty. It is the ROC that fought the Anti-Japanese War. It is the ROC that abrogated most of the unequal treaties with Western countries. For that matter, the ROC has its own claim to legitimacy to represent or rule China. Of course, the communists won the civil war and took over the whole of China except Taiwan. In Chinese culture, the CCP’s victory was acceptable at the time. It’s called “cheng wang bai kou,” the victor becomes the king, and the loser becomes a bandit. However, the legitimacy of the revolution can’t be automatically translated into the legitimacy of ruling or governing. In ancient China, the new ruler would claim that his ruling power was from heaven. In modern society, the voters authorize the governing power. The Chinese communist regime rejects both. Mao tried to establish the “continuing the revolution” to extend the legitimacy of the revolution that ended according to nature’s rule when he died. Deng Xiaoping and his successors tried to use economic development as the alternative. Well, the two digit GDP increases can’t last forever. After 65 years of rule, the CCP is still facing the challenge: Is the PRC the sole legal government representing the whole of China? And time is not on the CCP’s side. When Chinese delegates protested at HMUN, they were not defending “one China” but instead defending the communist regime. Another typical story involving China’s amateur diplomats happened in a conference in Portugal. Hanban, which is in charge of the Confucius Institutes all over the world, was a sponsor of the conference. Xu Lin, the head of Hanban, discovered the program also listed as a sponsor the Chiang Ching-kuo Foundation for International Scholarly Exchange from Taiwan. Xu charged that the program’s listing of Taiwan as a sponsor was “political” and ordered the removal of four pages containing the Taiwan sponsor’s information. Unlike the HMUN incident, the Portugal conference program didn’t have as an issue whether Taiwan was a country. There was no reason for Xu, or any other PRC official, to be angry. More importantly, what made Xu Lin believe that she had the right to judge what was “political,” and what made her to believe that she had the authority to take action? Even though Hanban is a state organ and Xu Lin a high-ranking official, she is still an amateur in international relations and diplomatic activities. Since Taiwan had used the same name to attend similar film festivals for years without any trouble, some believed that the incident was designed to embarrass Taiwan, Japan, or both. If that were the case, the spokesperson of the Ministry of Foreign Affairs of the PRC would have responded in the affirmative to a question from the press about whether the PRC was “blocking” Taiwan’s participation. The spokesperson used the sentence “we have noted relevant reports” as though he had gotten the news from media reports, just like everyone else. This raised a serious concern about whether what had happened represented the PRC. Such incidents happen all the time in different countries. Even though there is a Taiwan Work Office in the Central Committee of the CCP (which also goes by another name, the Taiwan Affairs Office of the State Council), if the incident happens in another country, or a third party is involved, it’s still the territory of the Ministry of Foreign Affairs. If the Ministry’s spokesperson only “noted” from “reports” like everybody else, people wonder who is in charge of China’s foreign policy. The worst scenario is that everybody—the instructor of the HMUN student delegation, the director of Hanban, the head of film festival delegation—has the power to make a scene at any international event based on his or her own judgment. Unfortunately, international affairs are very delicate and tricky issues. That’s why most of the countries leave this issue to professionals, such as State Department in the United States, to handle. However, it’s not the case in China. Why does the regime allow such amateurs to take foreign affairs into their own hands? The amateurs know what the CCP’s real Taiwan policy is—to make trouble for Taiwan’s appearances in international events. They would never get into trouble for doing so when they go back to China. Usually, they get an award for this kind of conduct. Those amateurs do things when it’s not convenient for the regime to do them directly. Such amateurs do things when it’s not convenient for the regime to do them directly. The regime easily denies its awareness of what has been done, but the amateurs’ actions send a strong signal. In the future, the hosts would try to prevent such embarrassment from happening again by following the CCP’s guidelines, or possibly worse, what they think are the CCP’s guidelines. Gradually, the organizations in Western countries that deal with the PRC’s cultural exchanges, sports, and educational programs begin to follow the CCP’s policy. One example: The Confucius Institutes openly discriminate against Falun Gong practitioners, but this discrimination is illegal in most Western countries. How many universities have said “no” to such a policy? So far, only one: McMaster University in Canada canceled its contract with the Confucius Institute following a teacher’s human rights complaint. Some other universities canceled contracts for other reasons and concerns. In most such cases, the organizers in Western countries accept the Chinese regime’s demands and values, not the other way around. As for the question of whether HMUN will reject similar demands from the Chinese delegation in the future, well, the organizer is not likely to make the same “mistake” in the future. As usual, it’s not the Chinese delegation, but its Western counterpart that learns the “lesson” and retreats. It’s time to engage the Chinese people, not the regime. The real question is, do we really need such “constructive” engagement with the regime? Have any of these programs accomplished anything so far? Maybe it is time to “get outside the Fourth Ring Road,” as Michael Auslin suggested in a recent Wall Street Journal opinion piece: It’s time to engage the Chinese people, not the regime. The recent defeat of Taiwan's ruling party in local elections indicates unease about the closeness of the country's ties with China. A Chinese health official has suggested that China’s organs be made available for export to Taiwan—but ethical concerns abound.